Buttons: The buttons are a combination of two parts: a plastic stem and a metal cap (brass or nickel silver). Using a plastic stem greatly reduces the weight of the instrument and is consistent with the practice of the earlier makers who often used either wood or plastic stems under metal caps. Lever assembly: The lever arms are cut from stainless steel sheets and are attached to the lever post with an adjustable screw. Vintage makers, Wheatstone and Jeffries, used crushed rivets to attach the lever arms to the posts. This system provides a more stable and therefore quieter and faster mechanism than some of the alternatives but it still has a problem in that over time, as the parts wear, a noticeable clicking sound develops (similar to a typewriter). It is sometimes possible to recrush the rivets a little to eliminate the clicking but it is very difficult to not go too far thereby causing the lever to permanently seize. 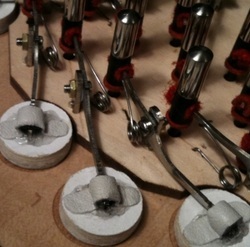 After making several dozen instruments using riveted actions, we developed our own adjustable action which allows the owner to tighten the action the required amount in order to eliminate any clicking that may develop. We designed our own threaded rivet for this purpose and have it manufactured to an extremely close tolerance. It has the advantage in that if it is overtightened, the procedure can easily be reversed giving the owner endless attempts to get it right without causing any permanent damage. Pads and Springs: We manufacture our pads using a sandwich of cardboard, felt and leather and we make our springs out of stainless steel wire.